A national investigative committee said in a TV interview Wednesday the cause of Monday's bridge disaster came from overcrowding on the structure and ensuing panic when the bridge began to sway. Bayon TV reported Wednesday the committee had found a crush of people on the narrow bridge stampeded when they thought the bridge would collapse. Mak Chito, chief of the penal department for the Ministry of Interior and a member of the investigative committee, said the government has not released an official statement about the cause of death on the bridge. An official statement is expected in the next few days. Meanwhile, the national government will request the city to erect a stupa on Diamond Island, near the site where 354 people died in one of the nation's worst disasters Monday. The government expects the city to find a suitable location on Diamond Island to build a stupa for the dead. Authorities lowered the death toll from 378 on Wednesday, saying some of those counted in the early stages of the disaster had been regular fatalities at the hospital. The country was prepared for a national day of mourning Thursday. A total 395 people were injured in Monday night's bridge stampede. 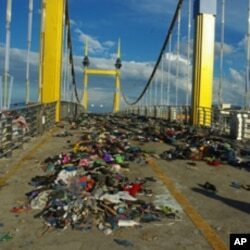 Diamond Bridge, which some are now calling the Bridge of Ghosts, was cleared of the shoes, water bottles and other debris that had littered the disaster zone on Tuesday. Piles of shoes and clothes were left on Diamond Bridge one day after the Water Festival stampede. Relevant authorities, including national and military police, city officials, the ministries of Health and Interior and others, were holding a meeting late Wednesday to discuss findings so far. Condolences from abroad continued to arrive Wednesday, including a letter from French President Nicolas Sarkozy. The minority opposition Human Rights Party canceled party meetings and talk shows in honor of the dead. The opposition Sam Rainsy Party said it was suspending plans to visit a border area in Kampong Cham province. The party will hold a seven-day ceremony at its Phnom Penh headquarters next week. Health officials said Wednesday that 354 bodies had been sent back home to their families, with a further 150 people still in the hospital. Families received $2,800 for lost loved ones—$1,250 from the government; $1,000 from the owners of Diamond Island, a retail development; and $400 from the royal family—Nhim Vanda, deputy chief of the national disaster committee, said. Health Minister Mam Bunheng said victims had died of suffocation or from being crushed under a mass of bodies. The government has informed entertainment clubs across the country closed on Thursday in honor of the tragedy.